Need to recap on episode prior to this, click HERE. Now we start off with Stefan having anger issues, asking his boss for time off and telling him he’s leaving town while showing him his dead girlfriend, Ivy, in the back of his trunk. So honest, but then again he’s being compelled. Elena is now Damon-free and with no thoughts of what happened between them, Jeremy is still struggling dealing with Bonnie’s death and it seems like there is a big party going down tonight and everyone is inviting everyone. We flash over to the other world where Bonnie and Damon are at the grocery store and then while they are there they hear the merry go round outside turn on, thus Bonnie say that it is a sign of hope. As they talk about hope and getting back to the real world all of a sudden they see cars, one of them being Damon’s. Things are starting to get strange because all of a sudden someone swooshes by. That “someone” ends up being a tarp but then the merry go round starts playing again. In Caroline and Enzo world, she tells him that he can NOT, whatsoever bring up Damon in front of Elena and remind her that she was madly in love with him. The party has started at the lake and Elena shows off her skills by swinging into the water. We see Jeremy making out with the girl that Elena attacked. Tyler’s temper is still up in the air and almost gets in a fight with a guy before Matt steps in. Elena tries to reunite all 4 of the friends, Tyler, Matt, Caroline and her to take jello shots because she feels like they are drifting apart, but no one wants to until Caroline gives in. Then things get a bit awkward leaving Elena all by herself. So now we see Damon back at a bar and then he hears someone! He walks a bit to find a stranger named Kai! Who is this dude? He starts talking to Damon and brings up his arguments and temper with Bonnie and explains why he is following him…to kill him. That’s when Damon talks a swing of bourbon and finds out it has vervain in it. Down on his back, Kai stabs him and breaks bottles more bottles to spray him with vervain. 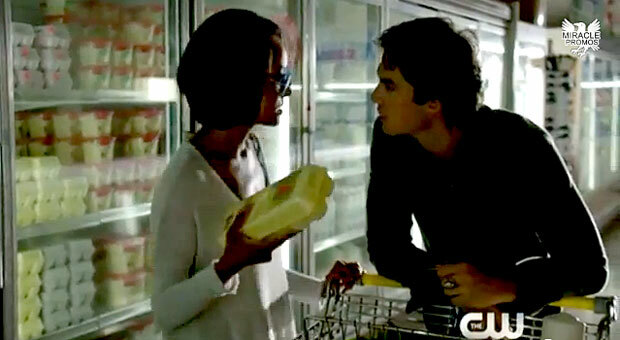 Right when he was going to stab Damon to death, Bonnie shows us and tells him to stop. Kai laughs and says she is a useless witch but that’s when she lights a candle and smiles. Bonnie’s powers are back! She tells Damon to run and lights the alcohol on fire, scaring Kai in the process until Damon comes from behind and knocks him unconscious and says, “Sorry I called you the most annoying person in the world.” Go teamwork! We go back to the party to see Enzo walking in the woods with ice and he gets stopped by Stefan who tries to kill him but then Enzo kills a hunter who was trying to get at Stefan. Enzo texts Caroline they have a problem and in the meantime Stefan picks up the gun that the hunter had and points it at Enzo only to have Caroline stop and ask why he is trying to kill Enzo. He replies, “Why don’t you ask him.” Now the guys have to get rid of the body and Matt sees that it is hid friend and Enzo tells him he’s a vamp hunter. 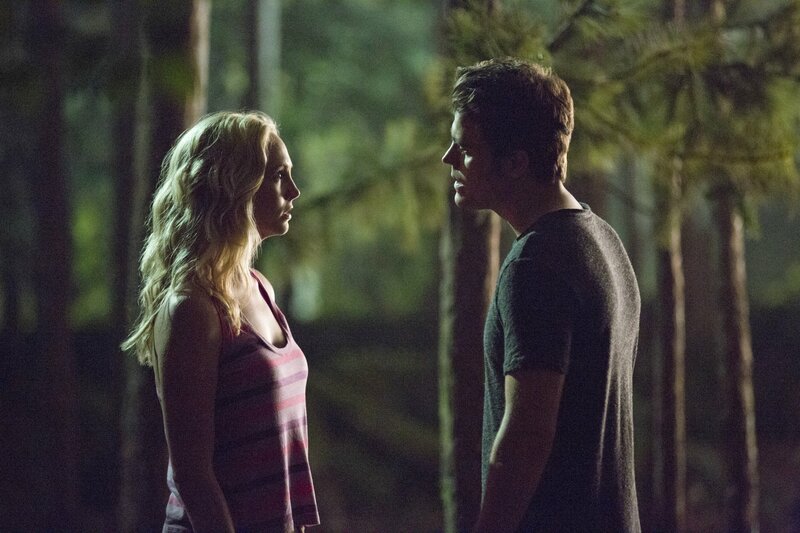 Caroline confronts Stefan and tells him that he does not need to run away from his friends, forget about them and move on. She pleads him to stay but he walks away. He only has one mission, to kill Enzo so he can’t remind him of Damon and move on with his life. Elena shows up and consoles Caroline. They head back to the party only to have Jeremy tell them that the girl that Caroline had compelled to get ice before didn’t go get it. He comes to the conclusion that once people head back into Mystic Falls the magic that was put upon them is erased. Which means that Sarah, the girl that Elena bit and ran free, now remembers that Elena is a vampire. Kai, the guy in the other world with B&D, wakes up at their place and is questioned by both of them. He confesses that he tried to make them believe that he was going to kill Damon because he knew she would show up and try and save him, thus making her channel her magic, which as we see worked. He tells her that Bonnie’s magic is their way out and in that moment, there is hope. Can’t wait to see how it all goes down in the next episode!